Dance you way into hearts of many with this beautiful musky scent enveloped with floral notes of fresh lilies and jasmine. 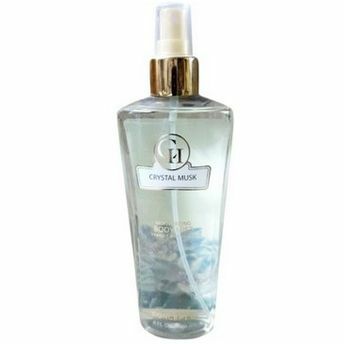 Concept II Crystal Musk Moisturizing Body Mist is a moisturizing spray mist that lifts your spirit and caresses your senses to give you the most gorgeous scent, that sniffs and whiffs around you, without ever being over the top. It has top notes of peach and apples, at its core notes of ylang-ylang, lily of the valley, and musk, enveloped in the base notes of musk, patchoulli, and mosses. Additional Information : Founded in 1988, Miami-based Concept II Cosmetics, LLC has become a household name in established and emerging markets for its exquisite CONCEPT II Bath & Body product line. You can wear Concept II Crystal Musk Moisturizing Body Mist for special occasion or daily use.